The Time and Talents association has rather special premises in a former Rotherhithe mortuary - but used to occupy an equally interesting building in nearby Bermondsey. Today, it is a charity providing community services for young and elderly people; when it was founded in 1887, it focused on encouraging privileged young women from the West End to help others, especially factory girls. 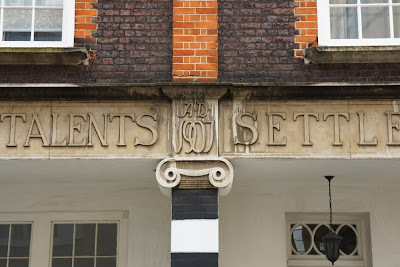 It was part of a wider settlement movement which created such London institutions as Toynbee Hall, all aimed at getting middle-class people to live and work among the poor they were trying to help, forming connections with them and sharing knowledge. Many settlements had religious connections too, and Time and Talents was an Anglican organisation founded by Minna Gollock, who was active in missionary work and sought to promote women's status and involvement in the missionary movement. 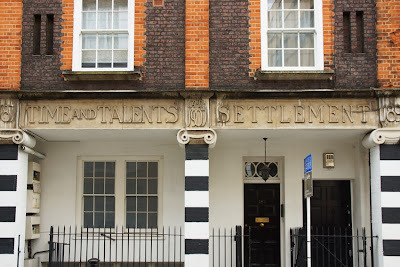 By 1899, Time and Talents had found permanent premises in Bermondsey Street which it would occupy for over sixty years. The building now on the site was completed in 1908 in Arts and Craft style, and included a hostel for young women as well as space for 'healthy recreation'. Its name is proudly emblazoned across the facade in rather wonderful lettering. The architect was Sir Reginald Blomfield. His varied practice included country houses such as Chequers; school and university buildings; The Quadrant, Regent Street; and the Menin Gate memorial in Ypres. Many of the Crosses of Sacrifice in First World War cemeteries were designed by him, including the one at Tyne Cot Cemetery, Flanders, which incorporates a German blockhouse in its base. Blomfield was also a friend of leading members of the Arts and Crafts movement including Edwin Lutyens and William Morris - although when he built Time and Talents, he was already moving away from that style towards Classicism. Today, the Bermondsey Street building houses studios and flats. The work of Time and Talents continues in Rotherhithe, but its former home in Bermondsey remains a tangible - and eye-catching - part of the streetscape. Remarkable black and white striped pilasters. They remind me of this former nurses' hostel in Langham Sreet to the east of Broadcasting House, though the style is not the same. That's a very fine building. thank you for writing about this - I took a photograph of this building when I was in london as I was very intrigued about the lettering its great to know what it was.